When Moses spent time in the presence of the LORD, his face would physically shine when he came down from the mountain. 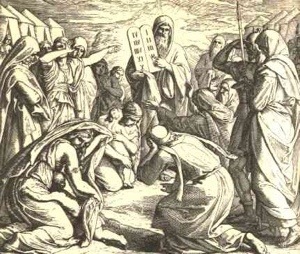 It was so disturbing, that Aaron, Moses’ brother and the high priest of Israel, suggested that Moses wear a veil. A respected brother of mine shared with a number of us a very profound illustration. Brant shared that when we go on vacation, people often recognize it on our face. We may look refreshed, or even sun-tanned. Either way, people can see that we’ve spent time in the sun. Moses’ face literally reflected the glory of God. When we spend time with God, people should be able to see it on our faces. People should be able to recognize that we’ve spent time in the Son. This entry was posted in Uncategorized on March 23, 2014 by jrobotromine.